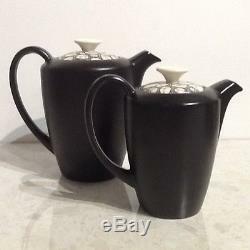 This lovely 1950's coffee set includes a coffee pot, hot milk pot, sugar bowl and 6 cups and saucers. 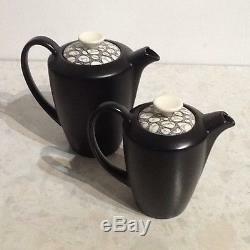 The coffee pot is approx 6" / 15 cm tall, the milk pot 5" / 13 cm tall, saucers are 4.75" / 12 cm in diameter and cups are 2.75" / 7 cm in diameter. 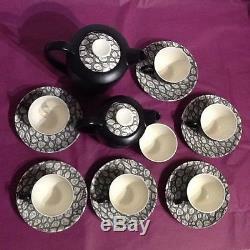 The set is in the stylish Black Pebble design and is in excellent condition with no chips, cracks or crazing. 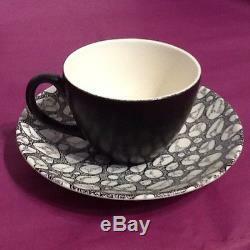 Please see our other Black Pebble finds. 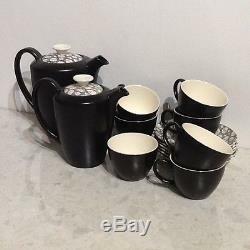 The item "VINTAGE POOLE POTTERY BLACK PEBBLE COFFEE SET" is in sale since Thursday, August 31, 2017. 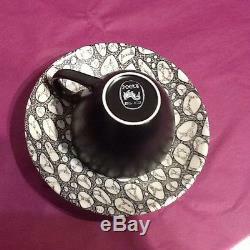 This item is in the category "Pottery, Porcelain & Glass\Pottery\Poole\Tableware". 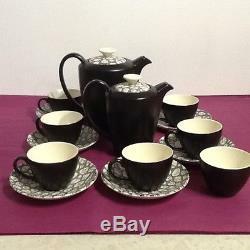 The seller is "pepper-pot7b" and is located in Wellington. 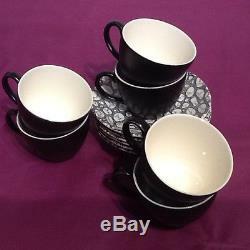 This item can be shipped to United Kingdom, Antigua and barbuda, Austria, Belgium, Bulgaria, Croatia, Cyprus, Czech republic, Denmark, Estonia, Finland, France, Germany, Greece, Hungary, Ireland, Italy, Latvia, Lithuania, Luxembourg, Malta, Netherlands, Poland, Portugal, Romania, Slovakia, Slovenia, Spain, Sweden, Australia, United States, Russian federation, Canada, Brazil, Japan, China, Israel, Hong Kong, Norway, Indonesia, Malaysia, Mexico, Singapore, South Korea, Switzerland, Taiwan, Thailand, Bangladesh, Belize, Bermuda, Bolivia, Barbados, Brunei darussalam, Cayman islands, Dominica, Ecuador, Egypt, Guernsey, Gibraltar, Guadeloupe, Grenada, French guiana, Iceland, Jersey, Jordan, Cambodia, Saint kitts and nevis, Saint lucia, Liechtenstein, Sri lanka, Macao, Monaco, Maldives, Montserrat, Martinique, Nicaragua, Oman, Pakistan, Peru, Paraguay, Reunion, Turks and caicos islands, Aruba, Saudi arabia, South africa, United arab emirates, Ukraine, Chile.